When Pastor Mark Messmore arrives at Troy Christian Community Church on Sunday morning, Warren, a WWII retired veteran, is already there brewing coffee. Before each service, Mark spends time catching up with church members. August 5, 2018 was different. That Sunday, the church was buzzing with excitement. Two services were merged into one, so people bumped around in the aisles and everyone squeezed in to find a seat before Lifewater’s representative went on stage. That weekend, the church of less than 300 people would raise almost $16,000 for a community on the other side of the globe. They would receive an additional anonymous $3,000 match, totaling nearly $19,000 to spur generations of transformation in rural Uganda. Preparation, unity among church leadership, and a focus on the cause made all the difference in creating a successful giving campaign. By August, Troy Christian Church had already given to two international disaster relief organizations in the two years prior. The church was becoming accustomed to highlighting one major ministry each year. 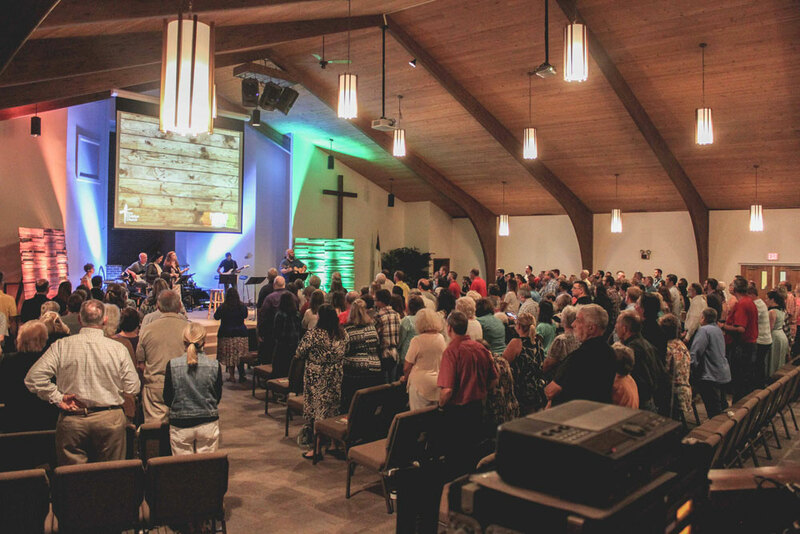 “Our congregation was beginning to expect and understand that we would have a big picture kingdom item each year that we’re working towards,” Pastor Mark said. This put Troy Christian Church in a mindset of giving. It created a church culture eagerly expecting to make a real difference for children and their families in vulnerable communities. In June, church leadership began to put up slides prior to the services about the global water crisis. The slides featured statistics, video provided by Lifewater, and compelling narratives about those living with contaminated water and poor health. “People began asking me about those slides, and I got to say, ‘Beginning July 1, we’re going to start doing something about it,” Pastor Mark said. In addition, the church geared sermons around the water crisis and hosted events like A Walk for Water, in which church members were invited to walk the 1.5 mile loop in a local park with a 50-pound jerry can filled with water. The practice is meant to illustrate the average journey for a child living without safe water. Troy Christian Church worships on Sunday. These activities and intentional decisions by Troy Christian leadership created an understanding of the problem and a mobilization to solve it within the congregation. “The most important thing is buy-in from your leaders and staff,” Mark said. Before they began showing statistics and video to church members, leaders and staff met together to share information about the cause, about key dates, and think through the best ways to support one another and raise funds. “They understood what was happening, why, and they were able to communicate and help with these things; and this way, not all the questions are coming to you,” Mark said. When the church leadership was united and driven by one common cause, that translated to church members. The children at Troy Christian are a great example of this. Together, they raised $1,500 to provide clean water. “This was a ‘we’ project; it wasn’t just me, this was us together,” he said. When everyone in the church understands what’s going on, there’s a sense of unity, and that unity aids in motivating people to partner together for change. On July 1, 2018 Mark announced that they were beginning the project to raise $12,000 for a medium-sized village to receive safe water and improved health in Kakumiro, Uganda. It would not only give the village safe water and health, but a future where children could attend school and families could save up money, propel business ventures, and spend more time together instead of being sick from waterborne illness or traveling long distances for water. August 5 was the big day of giving, and it was just over a month away for Troy Christian. Daren Wendell, Lifewater’s Director of Donor Relations, would be there to speak. Together, they would partner with a village. The key here is that people had the opportunity to prepare, to save. The cause was so prevalent that, on August 5, Mark arrived at church with a note and a check on his desk from a church member who was out of town but still wanted to contribute. From June to August, Troy Christian Church steadily and powerfully highlighted the water crisis and their ability to be a part of the solution. Weaving the issue into sermons, presenting statistics, narratives, and encouraging their children to give communicated an overarching need to the church and a sense of connection to families in rural Uganda. When we talk about giving, we often talk about how one North American church helped an international people in need. But, it’s important to remember that giving revives the giver. Giving revives and refreshes the church. 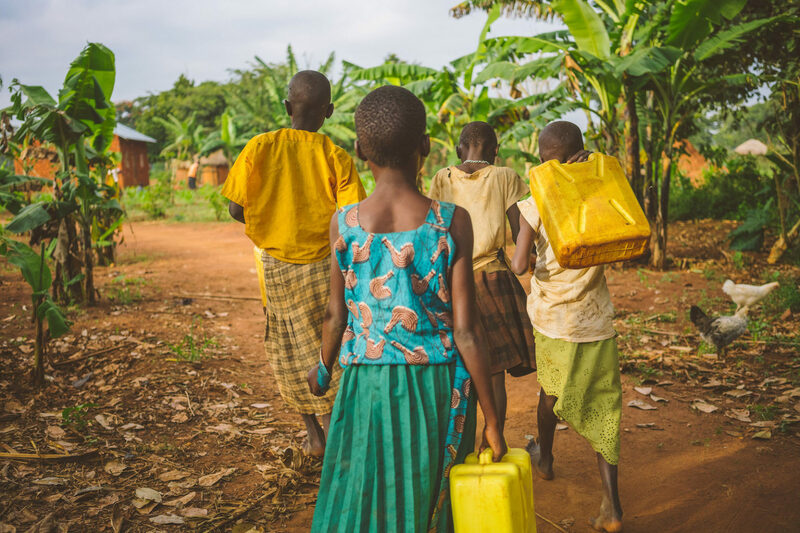 Young girls in Uganda carry jerry cans full of water to their homes. Mark went on to describe the unity and sense of ownership that this project created within Troy Christian and his excitement about seeing their impact in the years to come. “I’m excited about coming back to this as a reminder of what they’ve done and an encouragement of what they can do in the future,” he said. Troy Christian Church’s generous gift will make a village water project possible in Kanyegaramire village Kakumiro, Uganda to provide health training, safe water, and the good news of the gospel to many families in need.